We are Guides, Teachers and Healers in the Lineage of King Salomon with the Modern Mystery School. We are also students because we believe that the path to knowing oneself is a life long journey. The more you are prepared to empty your cup, the more your are prepared to receive. We maintain the integrity of our teachings and healing modalities through annual certification and are held to the highest standards of professional and personal integrity. We only teach and practise what we have seen work in our lives and help better the lives of others. Contact us to see how we can be of service to you. Cindy began exploring a path of spirituality and metaphysics through an academic lens when she studied comparative religion and philosophy in university as part of her undergraduate degree. Throughout the years she has also pursued studies in Zen Buddhist Meditation techniques, both the physical practise and philosophy of the Ashtanga yoga system, and Shamanism in the Native American teachings of the Sweet Medicine Way of the Twisted Hairs Métis Medicine Society. Cindy has also trained as a Thai Yoga Massage practitioner through the Lotus Palm School of Traditional Thai Massage. More recently Cindy has studied metaphysics through the Modern Mystery School. Cindy is a certified Teacher, Guide and Ritual Master in lineage of King Solomon through the Modern Mystery School. She has studied with the School since 2007 in a variety of energetic healing modalities, metaphysical teachings and specialized spiritual training. She continues to study and train with Master Teachers in the school today. Cindy is also a certified ashtanga, prenatal and postnatal yoga teacher with experience and training in kids yoga as well as fertility yoga. She has taught pre and post natal yoga at various Toronto studios for the past 8 years. She also has a B.A. in Political Science and Criminology from the University of Toronto and a Masters of Urban Planning from McGill University. Anthony is a natural empath who has always been able to connect with people, especially youth, at any level. A gifted hands on healer, Anthony's areas of specialty are chi building and reiki. Anthony is a certified Teacher, Guide and Ritual Master in the lineage of King Solomon through the Modern Mystery School. He has studied with the school since 2007 in a variety of energetic healing modalities, metaphysical teachings and specialized spiritual training. He continues to study and train with Master Teachers in the school today. Anthony is also a student of a variety of martial arts styles including Qi Gong, Kali and Savate and well as being a certified Youth Counsellor through George Brown College. He continues to work with high risk and autistic children and youth in the GTA. Mystery schools have existed throughout the ages and have been the caretaker of wisdom and teachings that are key to living an enlightened and empowered life. 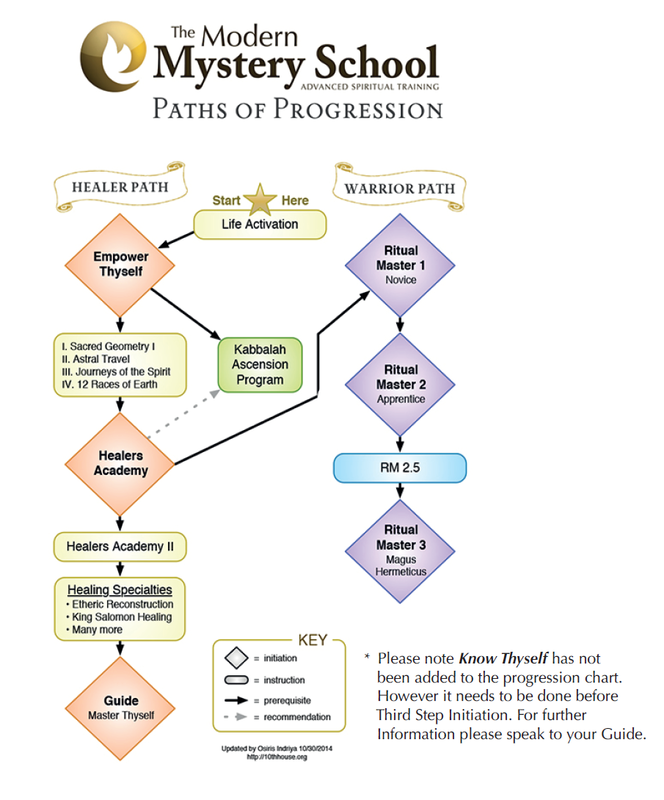 The western mystery school tradition is one that explores hermetic and metaphysical teachings. These teachings reach beyond dogma and beyond religion as they speak to the very nature of our being and existence. They have traditionally remained esoteric in nature, meaning that they were preserved, studied and handed down only to those with the inclination or aptitude to pursue them. As such, much of this tradition has been an oral tradition, although more and more teachings have been made available through the publications of various western esoteric orders and schools. But the handing down "from teacher to student" remains a key aspect of many of the teachings. While there are many mystery school organizations that share esoteric teachings, lineage is key in determining their legitimacy. The Modern Mystery School is the caretaker of the teachings within the Lineage of King Salomon, which dates back over 3000 years. While the mystery school tradition is much older than that, the lineage of the Modern Mystery School can be traced back to the teachings of King Salomon himself. The Modern Mystery School's international headquarters is located Toronto, ON. It's teaching centre is in Etobicoke, ON near Pearson Airport, which hosts international training programs as well as local classes throughout the year. For more information, visit the Modern Mystery School's website. It all starts with a Life Activation. A Life Activation is what opens the door to our connection with our Higher Self. Once that connection is established it enables us to learn beyond the mind and awaken our other senses. Empower Thyself is the foundational class that will give you an understanding of why we are here and what our purpose is. From there, teachings and healings are designed to support you along realizing and living that purpose here in the physical. The path of progression within the Modern Mystery School is one where the greatest growth comes from a process of continually empyting your cup so you can receive and evolve more.